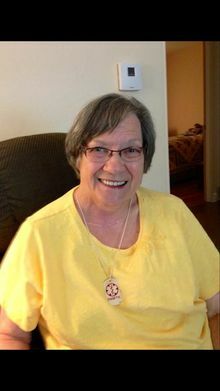 PROPHETSTOWN, IL – Mary Elizabeth Burke, 77 of Prophetstown, died Saturday, May 20, , 017 at her home. She was born on May 14, 1940 in Hopkinton, Iowa the Pof J. Russell and Mabel M. (Wilgenbusch) Guthrie. She married Robert Richard Burke on November 14, 1959 in Sand Springs, Iowa. He died August 13, 1979. Mary had worked for 22 years at Thermolyne in Dubuque, IA. She moved to the Prophetstown area in 2009 from Dubuque. Mary was a faithful member of St. Catherine of Sienna Catholic Church in Prophetstown. Survivors include three sons: Timothy J. (Michelle) Burke of Dubuque, IA, James R. (Ann) Burke of Prophetstown, IL and Michael R. (Anne) Burke of Rochelle, IL; her sister: Ruth Ann Burton (Doug Stephens) of Huntsville, Alabama; her brother James F. (Sue) Guthrie of Hopkinton, Iowa; 12 grandchildren and 6 great grandchildren. Celebration of the Mass of Christian Burial with take place on Monday June 5, 2017 at 10:30 AM at St. Catherine of Sienna Catholic Church in Prophetstown, IL with the Reverend Richard R. Kramer, officiating. Burial of her cremains will be at Mount Calvary Cemetery in Dubuque, IA. There will be no visitation. Arrangements by McDonald Funeral Home, Prophetstown. In lieu of flowers, memorials to EWTN (Eternal Word Television Network) would be appreciated.